1. Did you know that people are having Stock the Dorm parties? They register and everything. On the invitation, it lists the link to their registry. It’s like a wedding, only crappier. Um, if you need a prettier dorm, either get a job or deal with a set of 200 thread count sheets. 3. My, how specific, err, demanding we are these days. How about being grateful for a gift? If your dorm room doesn’t have custom matching bedskirts and drapes, it’ll be ok. Something tells me it will. 4. I also heard about kids who have Christmas parties and ask guests to bring gift cards. Apparently I need to have more parties for myself. I’ve only ever had birthday parties, a baby shower, and two wedding showers. How tragic. 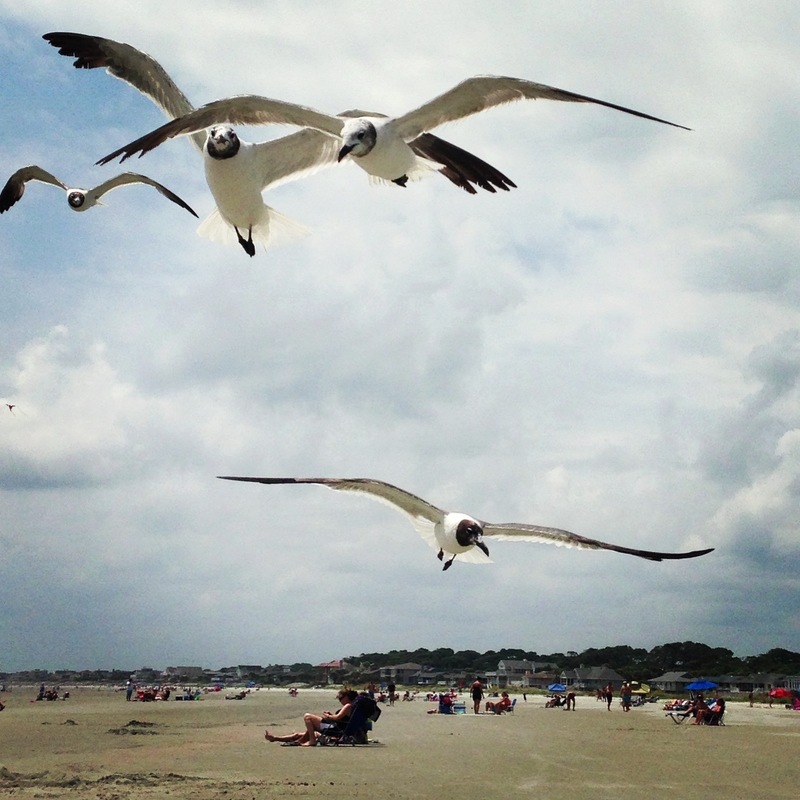 5.	Who taught you folks to feed seagulls chips and such? They may be pretty to look at, but they’re like rodents. They hover. Plus, when they’re done eating the Doritos they’ll poop on you. Have you ever heard them scream? They’re angry. 6. If you take a picture of your feet, say, on the beach, with a pretty view in the background, is that to simply prove you were there? The fact that you took the picture is probably proof enough. Besides, some of you need a pedicure. 7. How about a pedicure party? Maybe there’s even a nail color gift registry. Your BFFs will get you gel nails and spa pedis. Whoop! 8. As the end of summer comes again, I love (read: hate) to hear everyone complain about the heat. Last summer, you had an argument. This summer, it hasn’t even gotten to 95 degrees in Augusta. 9. I complain more about people complaining about the weather than just about anything else. 10. Trying to organize The Kids’ after school schedule is enough to make me crazy. I can’t imagine how y’all handle more than two kids. My two aren’t even over scheduled. 11. Babies aren’t expensive. Sure, it may seem like it at the time, but kids with after school activities break the bank. Life with kids is one big registration fee. 12. Speaking of expensive kids, when did The Boy start eating like a man? Between his dad’s 70.3 training and my son’s 9.5 year-old-growing-like-a-weed self, The Girl and I will surely starve. 13. There still seems to be a general freak-out happening about the “crime rash” in Augusta, GA. We are the second largest city in the state, and unless you live in a bubble, things happen. Be smart. 14. In spite of your ever present complaints, good things are happening in Augusta. Columbia County is seeing a retail boom, too. Whole Foods, Cabelas, Bass Pro Shops , a new movie theater, The Starbucks production plant, and a host of new restaurants and local retail shops are coming to the CSRA. Schools are growing. People are moving here. If you still think it’s all bad around here, either step up and help, or stop complaining. You could always find a new place to live. There are options. 15. Bad attitudes stifle progress. Have a beer instead. If sweet tea’s your thing, go with that. Cheers, y’all! ← be cool. stay in school. you might learn something. Amen to feeding the seagulls. We call them rats with feathers. We live on a lake and I won’t even let my kids feed the ducks. Once fed, they will not leave. I cringe when people feed the seagulls right behind your beach “spot”.